"Wide receiver Larry Fitzgerald #11 of the Arizona Cardinals is tackled by cornerback Josh Norman #24 of the Washington Redskins during the first quarter at FedExField on December 17, 2017 in Landover, Maryland." The running joke as a photographer is that the game is never won in the first half. While true, that doesn't mean a compelling picture cannot occur in the first couple or minutes. Thus was the case as the Arizona Cardinals and Larry Fitzgerald got their hands on the ball in one of their the first few drives of the game. Something prior to the game told me to bring a different lens than normal. Something inside of me also had me sitting behind the line of scrimmage. Because of both, I was able to get the above image of Fitzgerald going airborne. 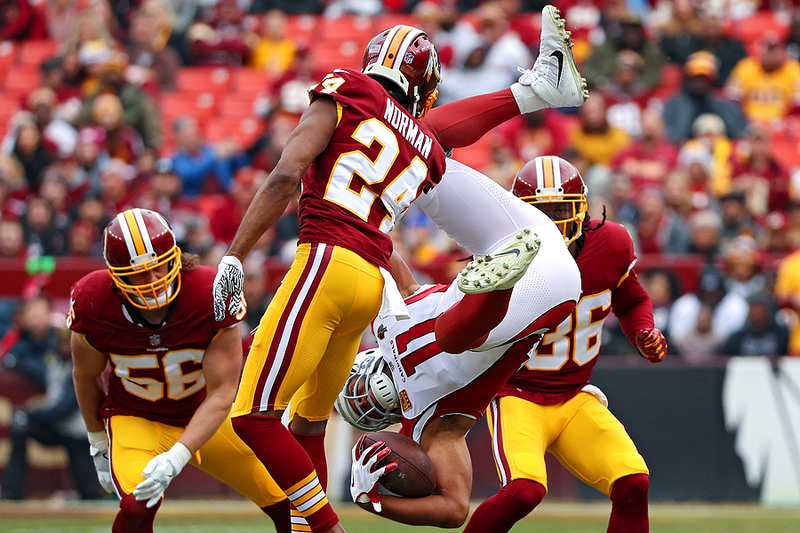 While not a stunning rectangle, it was an image that held up to be storytelling as the Cardinals fell short on a last minute drive in the fourth quarter - which resulted in a loss to the Washington Redskins.